James Forsyth was a Scotsman born in 1822 in Abernethy Morayshire. He was a coffee planter in Ceylon before he became Manager of the Wolverhampton and Staffordshire Bank, living his life after 1855 in Tettenhall, Staffs. The bank founded in 1831 had emerged from a run and closure in 1857 to become a solid and respected institution. James Forsyth would have been the Manager by 1876 when they opened new premises in Queen Square. This building still stands today as Barclays Bank. Forsyth was therefore the boss and likely banking mentor in the early career of Henry Evans. He was also the Godfather to Henry’s only son Charles Wilmot Evans. He died in 1909. 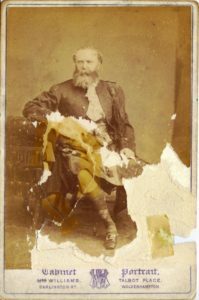 The damaged photo is labelled on the back General Forsyth, Wilmot’s Godfather. We do not know of any mainstream military background but it is probable therefore that he was a leading light in the Wolverhampton Volunteers.